At Appraisal-One, technology is the name of the game. We're great at making appraising look easy and we believe a large amount of that is our ability to increase our productivity with the newest gadgets. From smart phones and tablets to laser measuring and GPS devices, we are always looking to find better, faster methods for appraising. Call us geeks. Call us nerds. Call us what you will, but by all means, call us at 1-714-846-8726 for appraisal orders in Orange County! These days, appraisals are more difficult than they ever have been . Since cutting corners on analysis isn't an option for an ethical appraiser, we've found that the best place to save time is in our our workflow. In our effort to be the best we've found that using the very latest in new technology allows us to bring you more accurate reports, quicker turnaround times, and the very best in customer service. In the past, a lot of our orders arrived via fax and were confirmed with phone calls once we arrived at the office. It might be hours before a client even knew if we could do the order. Things are quite a bit different different now. These days, when orders are entered on the website, we get a digital notification. We often log into our site from the field and send back an email confirmation – including the time and date for the inspection if we've been able to talk to the occupant. When you order from Appraisal-One you can expect us to be concerned about your deadlines. We aim to reduce the waiting between communications and the faster we can get things done directly effects your bottom-line. This website definitely reduces cycle time for us and our clients by enhancing our communications. Delivery of appraisals as PDF files through email is definitely the standard these days. Many clients prefer email because they're accustomed to receiving attachments like PDFs in their inbox. It's much faster than previously, before the days of email. But,we've even been able to innovate report delivery with this website. Everyone knows how frustrating it is to lose a file. Or have you ever had an attachment blocked because of the file size? We provide a solution for those problems, too. When we send an appraisal, the client receives a link via email to retrieve the PDF. At that point, it doesn't matter if all the extra photos and maps in the report result in too big an attachment. The download link is even good for a full 90 days. So if anything happens to the file, you can log back into our site and retrieve it without having to wait on us to send it again. Gathering the data for an appraisal is an intensive process.. We spend a great deal of time collecting both specific information about the subject property and general data about the local market and developing trends. Appraisal-One employs technology to close the gap once again. 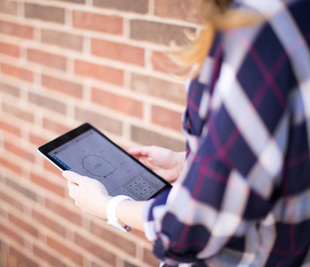 Instead of using paper forms and pencils and then re-keying all the information at the computer, don't be surprised to see us with a tablet or collecting data using an application for our phone that allows us to sketch a floorplan right on the spot. Rather than using a clumsy, outdated tape measure, more and more appraisers are utilizing accurate laser measuring devices, making even hard to reach areas accesible. We combine all of these different technologies to ensure your final report is complete and accurate, avoiding call-backs and revisions. This can be a real money saver for busy appraisal clients. It would be great if appraisers could complete an assignment, deliver it, and never be concerned with revisiting that report again. However, appraisals are used to demonstrate the condition of a property on the inspection date. Therefore, appraisers must keep their reports for 5 years, allowing them to recall any appraisal at any time to defend the valuation or to be used in legal proceedings. To sum it all up, Appraisal-One leverages our investment in to improve service. We store every part of the appraisal - notes, sketches, supporting documentation, and calculations - along with an electronic copy of the appraisal, we can pull up the entire file whenever it's needed and recall exactly what that assignment was about. We wanted to give you a bit of insight into how we use technology daily. Using the right software, gadgets, and a high level of customer service allows the appraiser to deliver reports more efficiently, with a higher level of accuracy. All of which helps keep our costs down, and ultimately save you, our cilent, time and money.